Offers visible results from 8 weeks. DESCRIPTION: Cellulase Advanced from Cellulase is the ideal solution to fight the most advanced states of orange peel skin with sharp, ever-visible undulations. Thanks to its active ingredients, it allows a maximum reduction of the accumulation of fats and liquids. The action of Cellulase Advanced is based on the natural complex Triple Layer, having in its composition a complex of vegetal extracts, that help to fight orange peel skin. 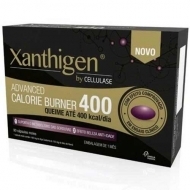 Cellulase Advanced is a dietary supplement. Food supplements are not substitutes for a varied and balanced diet and a healthy way of life. The effect is obtained with the consumption of 2 tablets per day and should not be exceeded the recommended daily intake.